Another excellent addition to the MWP library, Michele Wallerstein’s ‘Mind Your Business’ is about the one thing that all writers aspire to having one day – no, not an academy award – an agent. Wallerstein explains what the agent-writer relationship is like, what to expect and what not to expect and, more importantly, how the responsibility for your career does not rest solely on the shoulders of your agent. Sure, a good one can help you get a foot in the door of the right meetings, but they can’t hold your hand while you’re in there, they can’t tell you what to say and what not to say and ultimately they can’t do the thing that makes you a successful screenwriter – write your scripts. What a good agent will do is help you hone your work and polish it until it shines. They know what producers and studios are looking for, they know the market and they understand the hidden language of the system, the feedback from meetings and the expectations of your prospective employers and they will help you to navigate the perils and pitfalls of the Hollywood system; negotiate contracts, explain terms, deconstruct deals and reconstruct them in you best interests. Wallerstein explains all of this in concise and easy-to-read language. There is a lot here, from your first query letter to your big contract, but she makes it very palatable and ultimately – and this is the key part – understandable. There are ‘Special Tips For TV movie writers and TV Series Writers’, a very good chapter on ‘How To Get, Keep And When To Fire An Agent’ but the sections on ‘Money’ and ‘Dealing With Hollywood’ are worth the cover price alone. So, if your serious about your screenwriting career and looking for the real skinny on Agents then this book is the perfect addition to your library because as every professional knows, if the business side of your writing isn’t working the creative side will never flourish. 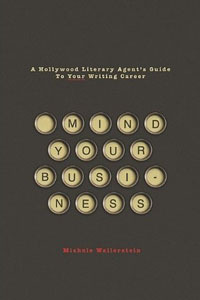 Mind Your Business: A Hollywood Literary Agent’s Guide to Your Writing Career is published by Michael Wiese Books and is available from Amazon , Blackwell, and all good book stores. You can read an excerpt from Mind Your Business for free at Scribd! Next post » 2010 Arthur C Clarke Award Shortlist Announced!